Accredited Training Company is a Gold Coast based professional training organisation for lifeguards and swimming instructors. We offer professional training and education in First Aid, CPR (Cardio Pulmonary Resuscitation), Advanced Resuscitation, Low Voltage Electrical Rescue, Anaphylaxis, and Asthma training throughout Queensland and northern NSW. For over 15 years Accredited Training Company (ATC) have been delivering regular professional training courses to members of the public on-site and through our mobile training courses. Although we offer a wide range of accredited training courses we specialise in providing a first aid course for first aid in the workplace. Our on-site training has now expanded to include the areas of Brisbane, Cairns and Townsville as well as the Gold Coast. We can also deliver group bookings where we will come to you to provide private training. Perfect for the needs of busy organisations and workplaces where co-ordinating training can be difficult. Our Bronze Medallion, Pool Lifeguard and AUSTSWIM training programs have been running for the past 20 years. 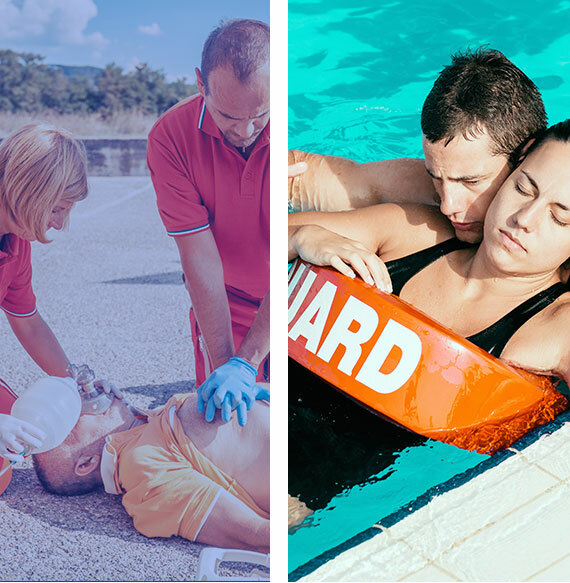 We also provide CPR, First Aid, Advanced Resuscitation Techniques, Asthma, Anaphylaxis, Low Voltage Rescue, Oxygen, Bronze Medallion, Pool Lifeguard and AUSTSWIM Teacher of Swimming and Water Safety Training. Each week we conduct public courses at various locations on the Gold Coast. Our educational courses are very competitively priced putting our courses in reach of virtually anyone who wishes to undertake them. Lyn Quirk is the director of ATC and is a co-provider of training for RLSSQ (Royal Life Saving Society of Queensland) and AUSTSWIM. Lyn provides training and assessment for all AUSTSWIM courses as well as the Bronze Medallion course and the Pool Lifeguard course. Certificates for these courses are issued by RLSSQ or AUSTWIM. We also teach fitness classes at Miami Olympic Pool on the Gold Coast, for Water Aerobics and Deep Water Running. Water based fitness training is perfect for people of all ages and fitness levels. Water exercises can be especially beneficial for people suffering or recovering from injuries such as with a back or knee where traditional types of exercise may be prohibitive. Accredited Training Company is a member of Fitness Australia, the Australian Resuscitation Council, Royal Life Saving Society of Queensland, and Surf Life Saving Queensland. We even offer a money back satisfaction guarantee on all our courses. If you’re not satisfied with the training or qualification, we will refund your tuition in full within 7 days. For information about our all our training courses including our first aid course, call our Gold Coast office on 07 5522 6542. Our office is open Monday to Saturday 8:30am to 6pm.